The line 14 is the most recent line of the Parisian Metro and the only one to be fully automated. It was inaugurated and put into operation less than twenty years ago, in 1998, which is about a century later than the first lines of the Metro. This is the reason why the stations on metro line 14 are very different from all the other metro stations in Paris. They are much more spacious and airy and their architecture is based on large volumes offering a lot of space and light. The platform of the station Gare de Lyon is my favourite. 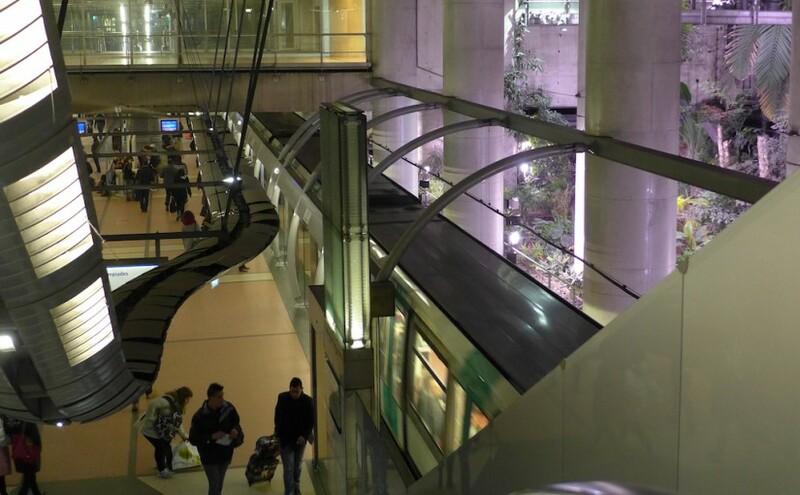 Indeed it offers an unsual view on a tropical garden on the right side of the trains towards Olympiades when they enter the station. This tropical garden is located on the basement of the ‘Maison de la RATP’ at the foot of which the station was built. It is really amazing to see such a green space underground and one wonder for a while whether one is still in the metro. Another specificity of the station Gare de Lyon is its central platform: It was in fact the only layout possible because of the numerous other rails already existing there when the new metro line was built. Back to earth: The train station ‘Gare de Lyon’ of course and nearby the Place de la Bastille and the Viaduc des Arts. And if you wish to enjoy more greenery I suggest you a walk on the ‘Promenade plantée‘, which starts from there : See my post about it!